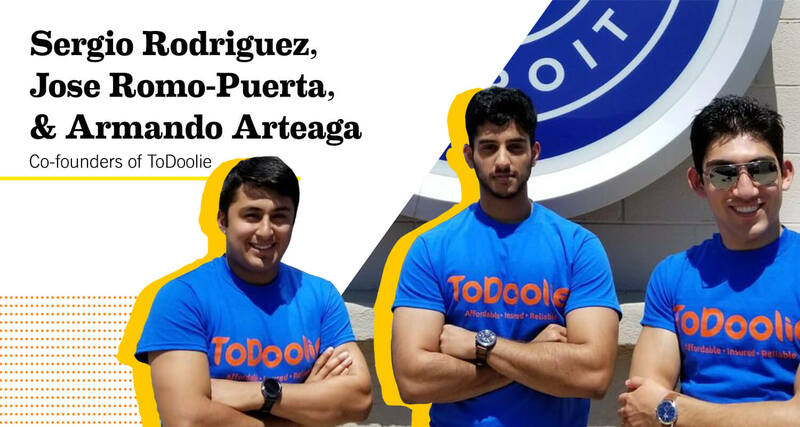 ToDoolie connects students around the house looking to earn extra cash with neighbors who need help around the house. As a high school student in Grosse Pointe looking to earn some extra money, Sergio Rodriguez would knock on neighbors’ doors to see if they needed work done – cleaning, moving, painting, yard work. When one neighbor paid him $70 to shovel snow, he knew he’d hit on something. “I realized I could make way more money doing odd jobs than my friends working for minimum wage at Cold Stone or Jimmy John’s,” he said. He knocked on more doors and grew his client base, then started charging a flat rate of $15 per hour for his services. Without really trying, Rodriguez had started a business. By doing odd jobs through college, he managed to pay half of his tuition at Wayne State University and graduate debt free. Upon graduation, he was ready to make the natural step of starting a formal business. In 2017, he launched ToDoolie, an online platform that connects college students to people who need help with everyday work. Students use the service to earn money by helping people finish tasks they’re too busy or physically incapable of doing themselves. While doing odd jobs himself, Rodriguez would regularly take friends to work sites. One of those friends was Jose Romo-Puerta. “Sergio kept me on his speed dial,” he said. Romo-Puerta was enrolled in classes in pursuit of a business degree when he was approached by Rodriguez, who was looking for business partners to help him launch and grow ToDoolie. Romo-Puerta grasped the opportunity and signed on as a co-founder. The partners have received a lot of help from Detroit’s entrepreneurial ecosystem. They participated in OptimizeWayne, a student-led business challenge at Wayne State University where teams attend workshops and learn from mentors before pitching their company to a panel of judges. At the culmination of the program, ToDoolie was awarded $2,000, which Rodriguez describes as an important first step for the enterprise. Next, they enrolled in TechTown’s DTX Launch Detroit, a 10-week business accelerator for college students and recent graduates. The founders received a $7,500 stipend for their participation, in addition to learning essential tools for startups, such as how to do market analyses and build minimum viable products to test with customers. At DTX, Rodriguez and Romo-Puerta also reconnected with Armando Arteaga, a classmate of theirs from WSU. Arteaga had a long journey to entrepreneurship. After struggling academically, he failed out of WSU and was homeless for a time. Realizing he needed structure, he signed up with the Army National Guard as an infantryman. on as their third co-founder and chief technology officer. Arteaga is currently a member of Bunker Labs, an incubator for veteran entrepreneurs, where he says he’s improved his ability to sell ToDoolie to potential investors. to the 40,000 customers it ultimately needs to become profitable. After completing app development and expanding to new markets, Rodriguez projects that this will take about three years. ToDoolie faces several challenges in getting to that point. For one, Rodriguez, Romo-Puerta, and Arteaga are all nontraditional founders—they’re all students, one is an immigrant (Rodriguez was born in Chile), and one is a veteran. But this is in many ways a competitive advantage because it’s prepared them for the twists and turns inherent to entrepreneurship. Their biggest challenge is time. All three founders have day jobs and are finishing school. That’s why they’re currently trying to raise $400,000. If they reach that mark, they’ll be able to pay themselves and hire staff. “We need a bigger team to scale with users so that they have the best experience possible,” said Romo-Puerta.